Double-sided heart-shaped pendant in gold and enamel openwork. A blue enameled frame surrounds an oval capsule with convex glass and translucent red and opaque white cartouche with wings. Such hearts, given as tokens of love, became popular in Renaissance jewelry. Occasionally combined with a sacred image, these tokens symbolize divine love. The Darnley (or Lennox) Jewel in the Collection of Her Majesty Queen Elizabeth II (Piacenti-Aschengreen and Boardman 2008, no. 280) is a prominent example. A heart pendant of the same period with a cameo of Mary, Queen of Scots, is in the National Museums of Scotland, Edinburgh (exh. cat., The Art of Jewellery in Scotland 1991, no. 2). 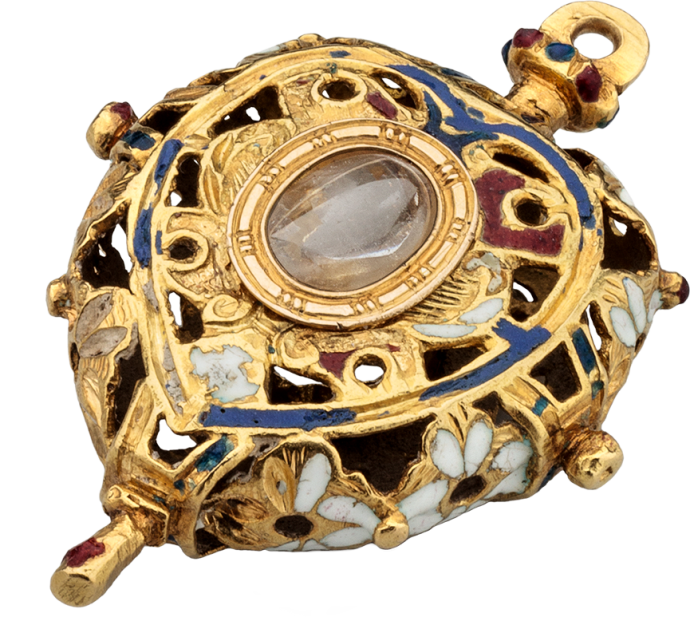 A heart jewel with the initials of Dorothea Maria, wife of Count Palatine Otto Heinrich (1556-1604) of the Wittelsbach family, was found in the Lauinger Crypt (Stolleis/Himmelheber 1977, no. 66). For heart-shaped devotional jewels with sacred images, cf. two pendants belonging to the Madonna of Trapani in the Museo Regionale Pepoli, Trapani (di Natale 1989, p. 66, nos. 7 and 8; di Natale/Abate 1995, I,24 and I,25). The style of this pendant resembles Spanish work; see Kugel/ Distelberger/Bimbinet-Privat 2000, no. 32.